As a first ever attempt, researchers have directly measured the expanding greenhouse effect of methane at the Earth’s surface. A team of scientists from the U.S. Department of Energy’s Lawrence Berkeley National Laboratory (Berkeley Lab) monitored an increase in the warming effect of methane—one of the most significant greenhouse gases for the Earth’s atmosphere—across a 10-year period at a DOE field observation site in northern Oklahoma. The outcomes of the study were reported online in the Nature Geoscience journal on April 2, 2018, in an article titled “Observationally derived rise in methane surface forcing mediated by water vapor trends.” The article shows that the greenhouse effect of methane traced the global pause in the concentrations of methane in the early 2000s and started to increase simultaneously when that the concentrations started to increase in 2007. We have long suspected from laboratory measurements, theory, and models that methane is an important greenhouse gas. Our work directly measures how increasing concentrations of methane are leading to an increasing greenhouse effect in the Earth’s atmosphere. Greenhouse gases are those that trap heat in the atmosphere, predominantly because they absorb specific wavelengths of energy emitted by the Earth. When there is a change in their atmospheric concentrations, the scientific community anticipates that the amount of energy absorbed by these gases will change accordingly; however, before this research, that anticipation for methane had not been confirmed outside of the laboratory. 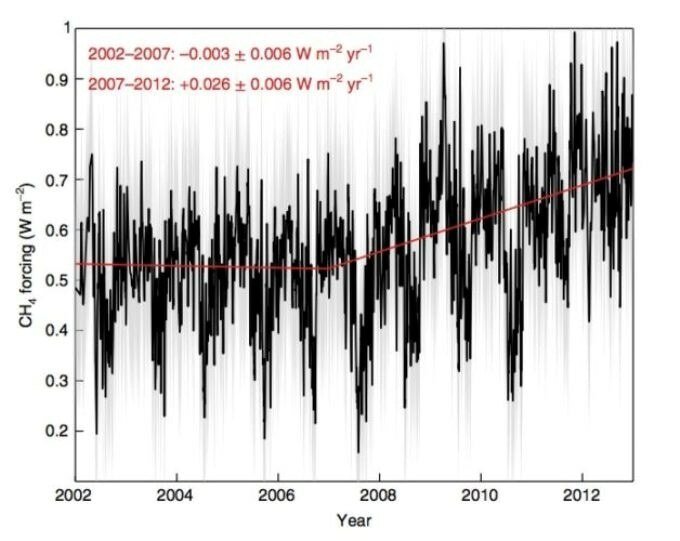 The researchers investigated highly calibrated long-term measurements to segregate the varying greenhouse effect of methane. They performed this by analyzing the measurements over the wavelengths at which methane is understood to apply its greenhouse effect and combined those with a series of other atmospheric measurements to control for other confounding factors, such as water vapor. This research was enabled by the extensive measurements of the Earth’s atmosphere routinely gathered by the DOE for decades at its Atmospheric Radiation Measurement (ARM) facilities, and otherwise, would not have been feasible without such detailed observations. The DOE ARM program supports and manages three long-term atmospheric observatories: the Eastern North Atlantic observatory on the Azores Islands, the North Slope of Alaska observatory in far-northern Alaska, and the Southern Great Plains observatory in Oklahoma. The program has also deployed three ARM mobile facilities and various ARM aerial facilities. Collectively, these assets allow researchers to conduct targeted and very detailed investigations to promote the basic scientific knowledge of the Earth system. The scientists are confident that this kind of direct field observation can offer a complete and more exact picture of the way atmospheric greenhouse gas concentrations are associated with their warming effect on Earth’s surface. The Department of Energy’s Office of Science funded this study.